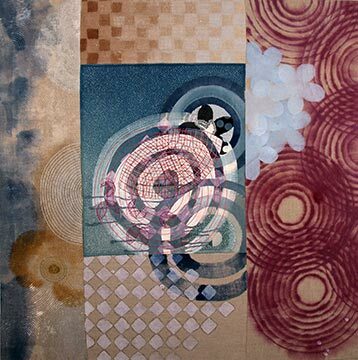 Karin’s work is a hybrid of improvisational painting, and exacting stitching. She uses the process of integrating these vastly different materials and techniques to create mesmerizing and complex abstractions. Shapes, patterns and movement build an elusive narrative that slowly unfolds. Karin has maintained a studio in Brunswick, MD, for many years while exhibiting nationally and internationally. Her work can be found in the permanent collections of the Boston Museum of Fine Art, the Renwick Gallery of the Smithsonian National Museum of Art, and the United States Embassy in Tashkent, Uzbekistan as well as many private collections. Her work was included in the seminal exhibition Pricked: Extreme Embroidery at the Museum of Art and Design in NYC and most recently in “Bead” at the Greater Reston Arts Center in Reston VA and “Transformations: From One Thing To Another” at Mclean Project for the Arts in Mclean VA. Please visit www.karinbirch.blogspot.com for a full list of exhibitions and reviews. Karin studied sculpture and painting at Corcoran School of Art in Washington, DC and painting at the Pennsylvania Academy of Fine Art in Philadelphia, PA. She is the recipient of the American Craft Council’s Searchlight Award (2007) and the Maryland State Arts Council’s Individual Artist Award (2003). She is also represented by Graver’s Lane Gallery in Chestnut Hill, PA.